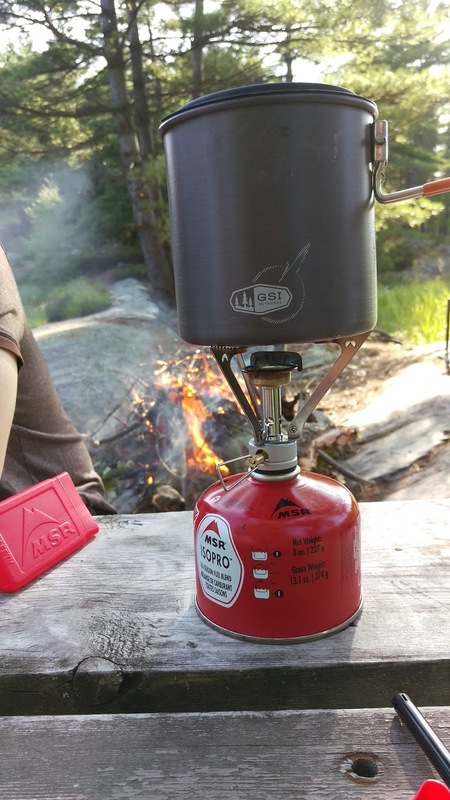 The GSI Pinnacle Soloist comes with a 1.1L pot with an attached handle that swings up and down, a lid with an integrated strainer and spout, a 590mL cup with a removable insulation strip, a “foon” (telescopic spork), a stove bag made for an MSR Pocket Rocket style stove (stove not included), and a stuff sack that can double up as a wash basin. Included in the set: A 1.1L pot, telescopic foon, cup with insulating strip, a wash basin and a strainer/lid. When I first went to MEC and looked at this set my initial reaction was that it is small... much smaller than I thought it would be. After unboxing it at home and seeing how it all stacks up within itself I realized that this was a well thought out product. The pot feels sturdy and light and the rubberized handle sits firm in its locked positions. The plastic bowl has a little bit of flex but not too much to be nervous about squeezing out your contents while holding it. 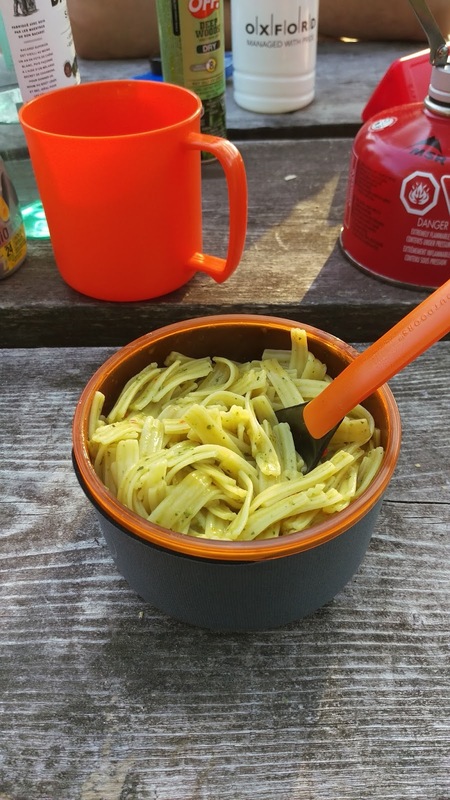 The pot lid is a hard plastic and I was skeptical about it not melting when in use. The stuff sack has a rubberized interior which allows it to stand on its own making it believable for use as a wash basin. The stove bag was a generic pouch made of canvas material. The telescopic foon (spork) felt flimsy and cheap in comparison to the rest of the superior contents. Unpacking and packing up the stove is a breeze as all the components fit into each other perfectly. As for actually using the product, it’s as simple as: fill the pot with water, set it on a lit stove and let the water boil, add food, fill your bowl with your cooked food, eat with the foon and clean up. 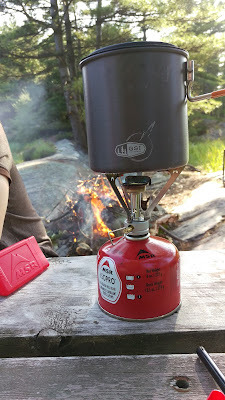 Simple stove to boil water! The GSI Pinnacle Soloist is advertised as a trail solution for one person, but I found that if anyone else in the group has their own mess kit it could actually be beneficial for two people. 1.1L of water is enough to make two Knorr Sidekicks or two of most Mountain House meals, two cups of coffee in the morning etc. And if there isn't enough water in the first boil, it doesn't take very long to boil another full pot. All of the included components work as advertised, my only gripe is that the telescopic foon is flimsy, cheap feeling and retracts itself under the pressure of you scraping the edges of the bowl for the last little morsels of food. Priced at $45.50 CAD at MEC, I believe this was a steal as some big box retailers offer crappier products that are bulkier and don’t include everything you need for a similar price. This complete storage system allows for a small fuel canister and a stove to be packed into it so the space and bulk savings in my pack is well worth the price tag. 500mL of water took, on average, three minutes to boil, and a full pot took about five to seven minutes (under perfect conditions). This meant I wasn't waiting too long to eat my meals. I ended up sharing the pot with a buddy and it worked well for the two of us. This set is small and took up very little real estate in my pack. I’d say this is a perfect set for a backpacking or portage trip where the luxuries are left behind. It could also be used on a car camping or “glamping” trip where you would want instant coffee or instant oatmeal in the morning. Ain't nothing like a bowl of noodles after a long day of portaging! Overall I am very impressed with this set. The pot boiled the water quickly, the cup held a generous amount of food and was soft enough to grip yet firm enough to not spill contents. The foon, unfortunately, was junk and I would recommend grabbing something else that is a similar size to keep the integrity of the way the set packs up. I never used the stuff sack as a sink, but it is capable of the function, even if it seems a little small. The entire set packs up tiny, and is pretty cheap. I will definitely be using this set in the future for my adventures and would definitely recommend it for your next adventure.